There are few rites of spring more satisfying than the annual clean. For many people, however, the pleasure comes only after the work is finished. 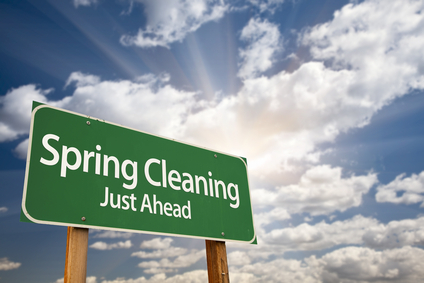 Your spring cleaning may never become effortless, but you can make the project more manageable — and even enjoyable. This printable checklist offers an overview of everything you need to know — including information on cleansers, stain removal, fabric care, and storage — to zip through the process and arrive at a happy end. After you read through the tips and techniques, tailor the list to your home and yard. Create a realistic schedule, keeping in mind that a single weekend won’t suffice, as you’ll need several days for more involved projects, such as shampooing carpets and organizing closets. Whether you prefer to proceed from the attic to the basement or start outdoors and wind your way inside, focus on one task at a time. And be sure to enlist the help of family members. The tips below outline basic techniques that will help you clean almost every surface (or object) in any room. The tasks on the next page are broken down by location, including outdoor spaces. The final page of this foldout focuses on window washing and upkeep, which is essential if you’re going to let the sun shine in on the bright days to come. Wipe Walls and Ceilings: Use a vacuum to remove dust. Tackle stubborn surface grime, especially prevalent in kitchens, with a solvent-free degreaser (test it first in an inconspicuous area to ensure it won’t mar the surface). Reseal Grout Lines: The cement-based material between wall, floor, and countertop tiles is extremely porous and stains easily. Protect it with a penetrating grout sealer; it’s best to apply it with a small foam brush. Vacuum and Shampoo Rugs: Synthetic carpets and rugs with wa- terproof backings can be deep-cleaned with a rotary shampoo machine and a hot-water extraction machine. Rugs without backings, including Orientals, require professional cleaning. Dust Books and Shelves: Take everything off the Shelves, and brush shelves and books with a feather dust- er. Use the dust-brush or crevice tool on a vacuum to reach into tight spots. Wipe the spines of leather-bound books with a clean, soft cloth. Clean Upholstered Furnishings: Take cushions outside and gently beat them by hand to remove dust. If there are stains, check the pieces for care labels. Use a vacuum’s upholstery and crevice tools to clean under seat cushions. Polish Metal Door and Window Hardware: Liquid polishes and polish-impregnated cloths work well for medi- um-tarnished surfaces; pastes and creams are for heavier work. If tarnish doesn’t come off, try a stronger product. Dust Your Home Thoroughly: This includes hard-to-reach places, such as the tops of ceiling fans and window casings. Always work from the top of a room down, vacuuming the dust that settles on the floor. Avoid using dusting sprays. Wax Wooden Furniture: Wipe surfaces with a soft cloth dampened with water and mild dishwashing liquid. Apply paste wax, such as Butch- er’s wax, a few feet at a time with a cotton rag folded into a square pad. Let wax dry; buff with a clean cloth. Ensure Fire Safety: Change batteries in smoke detec- tors (this should be done twice a year), and make sure units are free of dust. Teach everyone in your household how to use a fire extinguisher, and review escape plans. Clean Window Treatments: Many draperies and curtains are machine washable; check labels. Dry-clean fab- ric shades. Wipe wooden blinds with a damp cloth; warm water mixed with a mild dishwashing liquid is safe for metal and vinyl blinds. Sounds a lot like work doesn’t it? Why not have the maids at Exceptional Cleaning do the work for you. Give us a call at 678-887-4306. Or visit us on the web at www.atlantaexceptionalcleaning.com for a free home estimate. Megan Farley is the owner and founder of Exceptional Cleaning. Megan lives in East Cobb. Roomba, the good and the bad…….we will ignore the ugly. All of our Employees are personally hired and screened by Meagan. Our employees are never commissioned and are among the highest paid in the business. Your home will be cleaned thoroughly every time as it should be. Meagan is in contact with all of our Clients. We strive for perfection but if we fall short we will fix it.